This week, a UN expert group is meeting to address issues around so-called gene drives, a highly controversial genetic extinction technology with potential applications for agricultural, conservation or military use. The expert group (officially the Ad-Hoc Technical Expert Group, AHTEG, on Synthetic Biology) is convened by the UN Convention on Biological Diversity (CBD). One day ahead of the meeting, a large set of documents has been released, which show how this UN expert group process is being influenced by a covert operation run by a Gates-funded lobby firm. Following Freedom of Information requests by U.S.-based researcher Edward Hammond of Prickly Research, a large set of emails, the Gene Drive Files, was obtained. The correspondence reveals how external actors with a vested interest in the development of gene drives have organised amomg themselves to influence the work of the relevant UN expert group. The publication of the Gene Drive Files provides crucial and very worrying insights into these influencing attempts of the only UN process adressing this controversial but rapidly developing new technology. Civil society organisations, including Corporate Europe Observatory, have sent a letter to Dr. Cristiana Paşca Palmer, Executive Secretary of the Convention on Biological Diversity, calling for urgent measures to address conflict of interest in the CBD, its Protocols and subsidiary bodies. The deployment of gene drives can have vast ecological and societal consequences. One year ago, on 5 December 2016 170 groups from across the globe called on the Parties to the Convention on Biological Diversity to put in place a moratorium on the development, experimental application and environmental release of gene drives. New GM technologies like CRISPR are being used to have genetic modifications, like infertility, into organisms that will spread to all next generations. In this way, entire species could be wiped out. The documents show that public affairs firm Emerging Ag was hired with funds from the Bill and Melinda Gates Foundation to co-ordinate the "fight back against gene drive moratorium proponents.” Emerging Ag’s project - dubbed the “Gene Drive Research Sponsors and Supporters coalition” - was co-ordinated amongst others by three members of the UN expert group itself, who represent academic institutions. These members through their employers have financial interests gene drive development, which have not been declared. Other Europe-based lobbyists who appear in the email strings include Sarah Lukie, a biotech lobbyist at Brussels-based Croplife International. Previously, Lukie worked for the U.S. Biotechnology Industry Organization (BIO), the sister organization of EuropaBio. Ana Atanassova, Bayer’s biotech lobbyist in Brussels, is also part of the email exchanges. A formerly Brussels-based Ogilvy Public Relations executive, Jeff Chertack, now also sits in on the co-ordination team meetings of Emerging Ag’s “Gene Drive Research Sponsors and Supporters coalition” for the Bill and Melinda Gates Foundation. The Gene Drive Files reveal that Emerging Ag has also been collaborating with biotechnology lobby group Public Research and Regulation Initiative (PRRI), which runs a similar influencing operation. Piet van der Meer, a guest lecturer at Ghent University, explained in another batch of emails obtained from the Canadian government, how PRRI provides “back up team” assistance during UN talks to “like-minded” government and industry experts that are member of the UN expert group. A former Dutch government official, Van der Meer founded PRRI in 2004 with the stated goal to defend the interests of public researchers on biotechnology regulation issues. The group’s positions are closely aligned with those of industry. 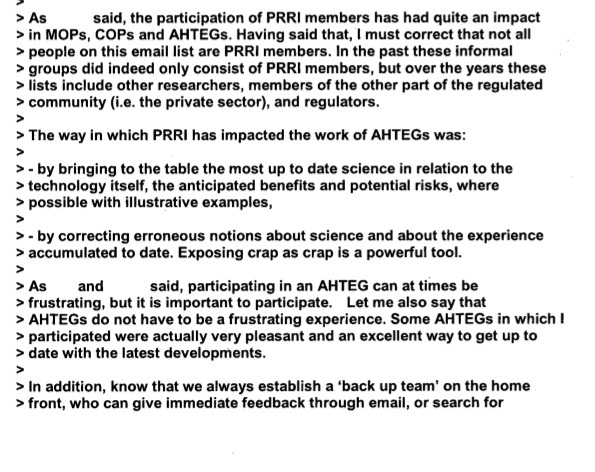 Van der Meer claimed that "the participation of PRRI members has had quite an impact on COPs, MOPs and AHTEGs" of the Convention on Biological Diversity, and indicated that PRRI runs email lists on several topics for its members, mixing in industry lobbyists and government officials. In an email dated 13 July 2017, which was sent to a long list of adressees, PRRI's Piet van der Meer attempts to co-ordinate lobbying efforts on different topics relevant for the UN CBD negotiations across industry-linked platforms. The list includes delegates of PRRI and ISAAA (another biotech industry-funded body), Emerging Ag employees, but also Sense About Science UK and ILSI (International Life Sciences Institute, an industry-science platform). The Gene Drive Files also show that the U.S. Military is taking a leading role in pushing gene drive development. The U.S. Defense Advanced Research Projects Agency (DARPA) has given approximately $100 million for gene drive research. 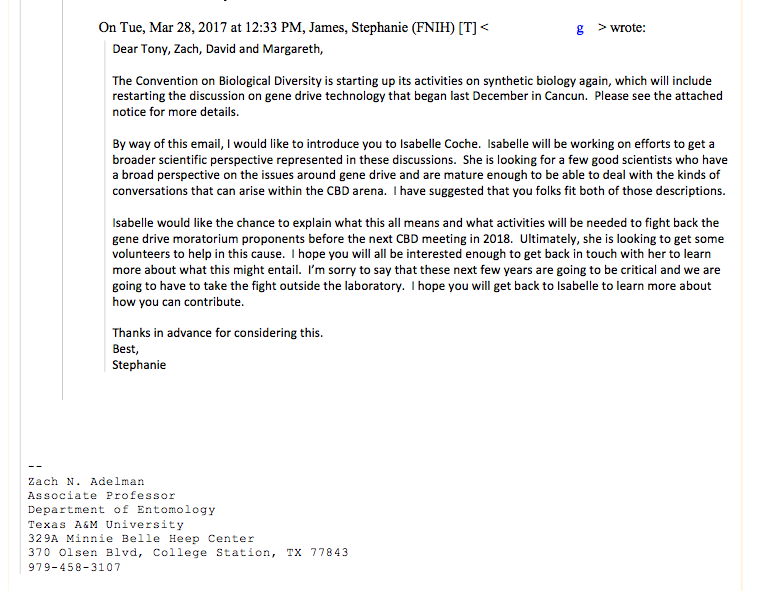 The emails furthermore reveal that the VP of Global Biotechnology for Monsanto was invited to give a presentation at a two-day meeting to initiate a classified gene drive study by the secretive JASON group of military advisors. Target Malaria, a gene drive project based at Imperial College in the UK, gets DARPA funding, however this was not disclosed.